Could Spinning Hammocks Keep Astronauts Healthy in Zero g? When astronauts get sick from zero g during long duration flights in zero g, the best medicine is to return them to Earth and full gravity. So, what if they could spend a few hours or minutes a day in artificial gravity during the flight? It's far easier to do this if humans can tolerate fast spin rates, say as fast as 30 rpm, at least for a short while. Artificial gravity varies as the square of the spin rate, for instance, at 30 rpm you get full g in a centrifuge with a diameter of 2 meters- while at 3 rpm, you need a diameter of 200 meters (nearly three times the size of the ISS). So far, nobody knows for sure if we can adjust to fast spin rates in space. But certainly many people can tolerate at least 24 rpm on Earth, for a few minutes. That's the spin rate of the Gravitron, a popular amusement park ride. Gravitron amusement park ride spins at 24 rpm and generates hypergravity inside, shows that most people can tolerate spin rates as fast as this for a few minutes at least. At this spin rate, you can get Earth normal gravity with a centrifuge diameter of 3 meters in space, or get 64% of Earth gravity with a diameter of 2 meters.. Even a few minutes of gravity, every day, might be enough to benefit your health in space. We will only know for sure if we try the experiment. A study at MIT looked to see if we could tolerate a similarly fast spin rate of 23 rpm for longer periods, an hour a day. They found out that we can, and what's more, you can adapt to it astonishingly quickly. After just five sessions their student volunteers reported far less discomfort in the centrifuge, and had had better co-ordination. In another study, the volunteers had three sessions, one for 14, one for 23, and then another for 30 rpm over three days. Of the 28 volunteers, 24 were able to continue through to the 30 rpm experiment with only mild motion sickness symptoms. Also, all the ones who dropped out, did so during the very first session, suggesting they needed pre-adaptation at slower spin rates first. It's not so easy to set up a spinning room type centrifuge like the one they used in the MIT experiments. But there is a simpler experiment you can do, to test your tolerance, and test this idea that it is possible to adapt to higher spin rates with practice. This is the experiment you can do at home. The idea is simple, just try spinning on the spot at various spin rates and see what works for you. If you try this every day for a few days you may find you can tolerate higher spin rates (as in the MIT study) or tolerate the same spin rate for longer. This is not meant of course as an exact simulation of space conditions. Just a way to experiment with variations of spin tolerance and the way you can become tolerant to higher spin rates. Here I demonstrate it in a video. The experiment itself starts at 6.30 minutes into the video after some intro covering things which you'll read anyway in this article. When you first try, then make sure you have things all around you to catch hold of if you fall, or a soft surface to land on. Start spinning slowly, almost imperceptibly, and gradually spin up. When you want to stop, slow down gradually. Expect your vision to get blurred at the faster spin rates. With the Mars and Earth gravity, 3 and 2 ticks per turn, it's easier to move your feet using two steps per second. Another thing, which I forgot to say in the video - if you turn always in one direction, say always clockwise, then you'll find you are not so well adapted to turns in the opposite direction. You can experiment and see if you can notice this effect. Try turning always in one direction for several days and see what happens (that's what they did in the MIT studies). Or, if you want to be equally adapted in both directions, try turning in alternate directions on successive trials or some such. Some people are especially sensitive to spinning motions, and feel sick even with the turns you get in waltzes. We have a popular program here in the UK called Strictly Come Dancing, where celebrity guests partner with professional ballroom dancers. Most years someone will find even the turns you get in a waltz hard to take. If they stay in the competition, eventually they get more used to them. Matt Baker doing Viennese Waltz for Strictly Come Dancing. He was one of many celebrities who felt sick during the waltzes in the competition. He went on to take second place in the final fo the competition. At the other end of the range, some hardly notice them at all. That's what I found, when I first tried this out. I could do ten or twenty minutes no problem at all. The next day I did 30 minutes at 30 rpm. Then the next day I did an hour at 30 rpm, and only stopped because I'd set that as my objective, to do an hour to match the MIT study. I felt a little bit of sickness in the middle of that session, but it soon went away as I kept spinning. Also, I felt sick for just a moment or two when I stopped. I'm not sure I'd have noticed anything if not looking out for it. I think I could have gone on for a lot longer, perhaps several hours, without problem. The figures I gave in the video, for a 1 meter radius centrifuge, are: 6 rpm for a quarter of lunar gravity. 12 rpm for lunar gravity. 18 rpm for Mars gravity. 30 rpm for full gravity. Here are some metronome videos you can use to try the experiments for yourself (made with my own Bounce Metronome). Quarter of lunar gravity as 10 seconds per turn, for 6 rpm. Lunar gravity, 5 seconds per turn, for 12 rpm. Mars gravity as 3 ticks per turn at 54 bpm - with extra ticks at 108 bpm to make it easier to change feet faster. Earth gravity as 2 ticks per turn at 60 bpm - with extra ticks at 120 bpm every half second to make it easier to change feet twice a second. The MIT researchers strongly recommended that it's time to send a centrifuge into space because there is a limit to how much we can find out on the ground. So, I got started thinking, could we design a centrifuge for the ISS? These fast spin rates suggest the idea of a tiny meters diameter centrifuge, with full g at 30 rpm. Since many of the modules on the ISS have a diameter well over 4 meters, you'd think it would be easy enough to fit this in somewhere. But it turns out, it's not as simple as that. Much of the interior of the ISS is already taken up by experiments, and it's hard to find any clear space large enough to fit it in (more on this later). I'll present the ideas for this "space hammock" centrifuge in a moment. I'm no engineer, so it is just to stimulate discussion. Before I get on to the idea, let's go into a bit more of the background. Meanwhile, you might like to think it over for yourself, how would you design a lightweight 1 meter radius centrifuge to fit inside a small spaceship or space station - and see what solution you come up with, and see if you come up with the same idea as I did, or some other solution. We've always been able to return astronauts to Earth long before their condition gets serious. Yuri Romanenko is a good example, one of the early Russian cosmonauts. He got highly fatigued in the last few months of his 326 day spaceflight. On return to Earth was back to normal health with astonishing speed. Within hours he could walk to a table to eat his meal, and he is reported as saying that on the next day he was able to run 100 meters which he attributed to the exercise routine he followed on the spaceflight. Within a couple of months you can get back to almost normal health. Bone recovery is longer and takes several years. There is a lot of individual variation in the effects of zero gravity and how long it takes to recover. For an idea of what it feels like for the astronaut, see Chris Hadfield after space: A windy road to health recovery. You can't return to Earth in the same way if you are, say, in orbit around Mars. We don't know for sure what happens if astronauts have to stay in zero g for years, with no option to return to full g if they get sick. But our bodies are not used to zero gravity, and there are so many changes in how it functions, that it might well be fatal. If you can take artificial gravity with you, in a short arm centrifuge you might not become sick at all; or it might progress so slowly that you have plenty of time to return to Earth before it becomes serious. The 1970s engineers wanted to create an environment suitable for anyone, and where you can go about every day activities and do delicate tasks with fine hand eye co-ordination. They assumed that this requires slow spin rates of 1 rpm or less, and slow spin rates require long tethers for the same amount of artificial gravity. That's why they designed such large kilometer scale habitats like the O'Neil Cylinders and the Stanford Torus, or habitats pivoting around tethers hundreds of meters or kilometers in length. The bottom line is that so far no astronaut has ever been exposed to artificial gravity in space for long enough to detect any medical issues at all. All we have are the Gemini tether experiments which didn't produce a level of gravity to notice, and the experience of the Skylab astronauts jogging around the jogging track, which was not done as a medical experiment, but they seemed to manage fine with no discomfort. Coriolis effect acts in a different direction. It's awkward to walk in straight lines in centrifuges on the ground, or to move your hand horizontally. This would not be an issue in space, and instead you'd feel the Coriolis effect when you stand up suddenly or sit down suddenly or move your hand vertically. Spin reversal. In space, the spinning sensation in your ear will reverse direction if you turn your head around (spin reversal). So for instance if you look in one direction along the spin axis, your head tumbles in a clockwise vertical tumble, if you look in the opposite direction, your head tumbles anticlockwise. The canals in the vestibular system in your ears should be able to detect this. This effect never happens in the usual experiments on the ground if you keep your head vertical so parallel to the spin axis, though they can happen if you turn your head around with your head leaning sideways, or if you turn your head upside down. The feeling in your ear is different. On the ground, then your horizontal canals in the vestibular system get stimulated. In the artificial gravity in space, it's a tumbling sensation and your vertical canals get stimulated (depending on orientation). The end result is, we'll never know for sure until we try out artificial gravity in space. Meanwhile the spinning experiments on the Earth give us our best guess at what's possible. But it could be different in either direction when we try it out in space. So, if someone says, for instance, that you will experience nausea after so many hours at such and such a rpm, this is based on no data at all from space. So far, no-one has ever experienced nausea as a result of artificial gravity in space. About the only thing you can say for sure is that some astronauts at least can withstand half a minute or so at maybe 10 to 12 rpm - because that's the speed at which the astronauts jogged around inside Skylab in the video clip they did - and they clearly didn't experience nausea, and stopped just because they had other things they wanted to show on film. With this newer idea, astronauts only use the centrifuge for sleeping, or resting, or for exercise, or when they eat their meals. You can use higher spin rates if you only care about nausea, and aren't bothered about more subtle effects such as fine hand eye co-ordination in the spinning environment. Also, you don't need to move your head much when sleeping, eating, or exercising (depending on the exercises). You can stand far higher spin rates, without nausea, if you can keep your head still or move it less frequently. I've already mentioned the MIT study, which showed dramatic improvement in co-ordination and well being over 5 days. But this might well be just the start of a longer process. You can get an idea of how well some people can adapt eventually, when you realise that ice skaters can come to tolerate amazingly fast spin rates of several spins per second, and averaging over 100 rpm through much of their routine. They don't experience nausea at all. They do feel dizzy but not during the fast spins, rather, they feel dizzy briefly when they come out of them. The ice skaters spin only for a few minutes at a time in their routine, but it shows how you can adapt, with enough time, to conditions that would make most people nauseous within seconds. Similarly also, whirling dervishes can tolerate spin rates getting on for 40 rpm for long periods of time (e.g. half an hour). Whirling Dervishes ceremony - the spinning continues from 29 minutes through to about 59 minutes. I timed it at getting on for 40 rpm. There's a lot of individual variation. Some people are ultra sensitive to less than 1 rpm, while others can tolerate high spin rates. So with this new idea, instead of designing the whole station around the most susceptible members of the population, you can let individual astronauts set whatever spin rate is suitable for them. Over the months and eventually years in a space station they'd gradually come to tolerate higher spin rates and longer duration spins. If you can extend that to, say, ten years, that could make a huge difference, That would give you enough time to spend years in a space station in the L1 or L2 positions, with no need to send new crew every few months. It would also give you plenty of time to visit almost anywhere in the inner solar system, possibly as far as Jupiter; and return to Earth. Perhaps a small spaceship with a simple spinning hammock might be all you need, at least, for for astronauts who can tolerate fast spin rates and who benefit most from this high rpm artificial gravity treatment. Hammock on a tropical beach. Let's get down to the details of the idea. When the centrifuge is as small as 1 meter, and spin rate 30 rpm, so a spin every 2 seconds, that makes the velocity 2 * p / 2 = p meters per second, or just over 3.14 meters per second. That's pretty slow. The astronauts jogging inside Skylab moved at about that speed. Video of Skylab astronauts on its jogging track. For maths geeks: here is a fun almost coincidence. The acceleration due to gravity, 9.81 m / sec2 (approx), is pretty close to the artificial gravity for a 1 meter centrifuge of p2 = 9.8696 m / sec2 (velocity squared divided by radius of 1). Also, our centrifuge doesn't need to be able to withstand hypergravity, and doesn't need to stand gravity pulling at its arm downwards. So what about just putting the astronaut in a spinning hammock? A lightweight construction strong enough to hold the hammock up under full gravity will do just fine. So here is my idea. Let's suppose we can fit it into one of the modules of the ISS somehow. Call the four walls, arbitrarily, the ceiling, floor, left and right walls. Then, there are two possible orientations for our hammock. First, it can go vertically, parallel to the axis, a similar arrangement to the gravitron. This would trigger a spinning sensation in the horizontal canals of your ears. The other way is to have the hammock parallel to the floor and ceiling, at right angles to the axis, with head following feet (or feet following head) around the axis. This way, you'd experience more of a tumbling motion, with vertical canals stimulated. This horizontal arrangement is closer to the sensation you'd expect when sitting or standing up in a larger centrifuge. But, if it's put into a passageway type situation, as in the picture, you might need to lie in a curved position with head and feet up, like the position you'd go into in a hammock, to avoid hitting the walls as it spins. Ideally you could have both arrangements. Humans might be able to tolerate one direction better than the other. Also there could be individual variation. It would be interesting to find out if astronauts with experience as ice skaters, or whirling dervishes or ballroom dancing are pre-adapted to the direction parallel to the axis, better than the other. And perhaps sailors with experience of rough seas, or sky divers and snowboarders used to tumbling movements would be happier resting in a direction perpendicular to the axis. NASA like all government agencies in the USA have a policy of keeping the medical records of their staff private. Astronaut's medical records are normally released only when they die, and until then they only release aggregate information. This is sometimes frustrating for medical researchers who would like to see the raw data and re-analyse it in different ways. Perhaps some kind of a release form can be arranged, so astronauts can share medical details relevant to the experiment if they want to. Potentially, this could be a fair amount of data, including whether they have done any pre-flight centrifuge adaptation experiments, or are experienced as sailor, ice skater etc, their resting heart rates on Earth, and in the ISS, and you would also want to study the effect on their general health when outside of the ISS. But you could do it so they can voluntarily share as much or as little data as they like. Or, if that's not possible, at least, we would get the aggregate data from NASA after a fair number of astronauts have tried the experiment - and can get full medical details from astronauts from other countries, such as Russia, who don't have this policy. You'd be able to sit up, e.g. to eat a meal, or read. You could do exercises also, e.g. sit ups, and bench presses. You could stand up actually as well, but because it is just 2 meters in diameter, your head would then experience gravity in the opposite direction. That's possible for sure, sky divers experience it when they tumble. Also the skylab astronauts did tumbling motions in skylab 2 for a few seconds at at time. Sky diver tumbling 60 times in a minute. This indoor skydiver will experience hypergravity in opposite directions in his head and his feet. Asuming roughly 0.5 meters between head and the centre of gravity, then the perceived artificial gravity is 2 g - and because he is suspended in the air, it's combined with normal g, so the gravity on his head will vary between 3 g and 1 g as he tumbles. The gravity on his feet would be rather more, if they are at one meter distance from the c of g, then the hypergravity varies between 5 g and 3 g.
However, one of the effects of zero gravity (especially in early days until you get used to zero g) is that you get too much blood going to the head. So if you experience that, might be best not to do that much by way of tumbling. I suggest that we use a strong lightweight material to save on weight, perhaps carbon fiber. The motors can be small and don't need much power. It's like spinning a cycle wheel, it's easy to spin up, and once you set it going it just keeps going by itself. Let's join the hammock to the pivot motors with stiff rods rather than ropes or cables, to make it easier for the motors to spin it around. The hammock can be designed so it's easy to take it down or fold it to one side out of the way. As a safety measure, we could design it so that you stop or start the spin by hand as well. Perhaps if you put your hand out and touch a wall, if any resistance is detected, it would stop you spinning immediately. Then, might be fun to do it so that if you set yourself spinning again, someone pushes you or you push against a wall, the motor kicks in to keep you spinning at whatever speed you are going. making it effectively "frictionless". It would also have a pad you can use to dial in a desired spin rate, from quarter of lunar or less all the way up to full gravity, which would be the maximum, unless there is some reason for looking into hypergravity effects as well in space, or ultra short centrifuges. It could go to less than a 1 meter radius, especially with the orientation parallel to the axis, for those who learn to tolerate really fast spin rates. For instance, you could explore full g at, say, 60 rpm with the radius only a quarter of a meter. In the other direction, with a larger radius, spin rates can be smaller, e.g. radius 2 meters (4 meters diameter) gives you 21 rpm for full g (or 13 rpm for Mars g), which could be helpful for those who are more sensitive to spins. If you have a 6 meter diameter hab like the larger Bigelow ones, you can do 17 rpm for full g, 11 rpm for Mars, and 7 rpm for lunar gravity. You can calculate more numbers like this with the artificial-gravity.com Spin Calc. (Mars gravity is about 0.379 of Earth's, and Lunar is about 0.166 of Earth's). Some of the papers, including the MIT one, suggests an orientation with heads towards the center of the centrifuge for artificial gravity experiments in space. Maybe that's just because they think of the astronauts as standing up rather than reclining? If the centrifuge is for resting, exercise and eating, then I think best to let them recline to reduce the gravity gradient. Sleep, especially, would be more comfortable in a reclining position. But it should be designed so astronauts can sit up. You could also have an optional centre rod you can slot in between the two centrifuge motors - just for something for the astronaut to hold onto while sitting up or for exercises (such as pull ups) - or if he or she wants to try standing up on the hammock and tumbling around the central axis.. This is one engineering detail we need to look at briefly. As the hammock spins up in one direction, the ISS will start a slow spin in the other direction (by conservation of angular momentum). The ISS is much heavier of course, with a mass of about 420 metric tons, and over 50 meters in length. Just one ton at a distance of 25 meters has getting on for 9000 times the moment of inertia of a human with weight of 70 kg at 1 meter. I'm not sure what the moment of inertia of the ISS would be, it depends on the distribution of the mass, but probably at least a hundred thousand times that of our astronaut in the hammock. Nevertheless, that means that if you spin around in the centrifuge perhaps a hundred thousand times or so, then the ISS would spin around once. At 30 rpm, that means the ISS would turn around perhaps once every day or two. When you stop spinning then the ISS would stay in its new position. That might not be much of an issue however, because the attitude of the ISS is controlled by its Control Moment Gyroscopes. It's also kept in position by the gravity gradient of the Earth's gravitational field. If necessary, then we need to add a counter rotating flywheel to the design. This would be enclosed of course, and spinning far faster than the astronaut - perhaps attached to the ceiling or the floor around the motors (or both). If we don't need this in the ISS it might be a good feature in a smaller spacecraft. It's rather frustrating, actually. The ISS modules are nearly all more than 4 meters in diameter, yet there doesn't seem to be anywhere to put it. Columbus module on the ISS. With a diameter of over 4 meters, there could be plenty of room to fit in a 2 meter diameter centrifuge. But the way the interior is organized makes this impossible. The walls are squared off, as shown - and you also have experiments covering the walls as well. Most of the other ISS modules are similar. You'd have plenty of space for a centrifuge, except, that the interior is filled with experiments and other things, to a depth of a meter or more in all directions. The larger spaces are already taken, for the eating area, tea rooms, or the zero gravity exercise machine. The few larger areas are already occupied e.g. by the zero gravity exercise machine in the Tranquility mode. Zero gravity exercise machine. This is in the Tranquility module, and there would be enough space here for a 2 meter diameter centrifuge but of course the space is already in use. Tranquility mode when it was first installed, with plenty of space for a 2 meter diameter hammock inside. 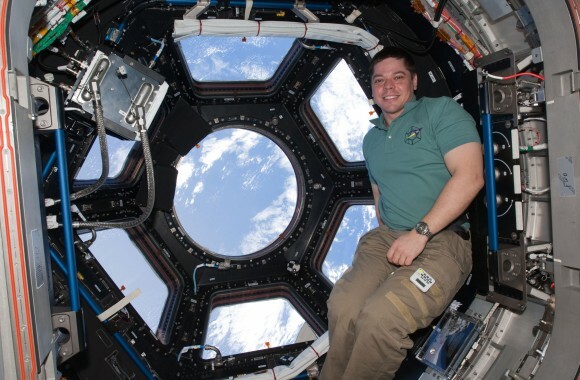 The Cupola is almost big enough, but not quite, and there isn't much space between it and the main ISS. The cupola isn't quite large enough either - this shows Robert Behnken inside the newly-installed cupola - since then many other things have been added. It rather looks as if we'd have to re-arrange, even re-engineer the interior in some way to fit in a 2 meter diameter centrifuge. If that's not possible, then perhaps we can get an opportunity to add one to the Bigelow BEAM inflated habitat dcue to fly to the ISS in 2015. Bigelow BEAM habitat, due to fly to the ISS in 2015 for two years as a technological demo. External dimensions when inflated: 4 meters long, and 3.2 meters in diameter. Perhaps there might be enough space for a hammock style centrifuge inside, if it doesn't get filled up with too much by way of other apparatus? Bigelow BA 330 at 6 meters diameter as planned, would have plenty of space for even large centrifuges. It's large enough for something like the Skylab jogging track. Russia also are planning to build an inflatable habitat for the space station. This is for discussion, what do you think? Any better ideas for the design? Is there anywhere to fit it inside the ISS? 3) Operational procedures that advance the capacity of the ISS U.S. National Laboratory as a research and technology development platform to benefit life on Earth. You have until April 10th to submit a step 1 proposal. It's not that long I know. I think you could make a pretty good case for it though, if there is anywhere to fit it in the ISS. First of all, it is a useful experiment whatever we discover. Surely it will be of some medical benefit to the astronauts, but whether or not, it will be the first ever proper experiment in artificial gravity in space. It gives us the first data points, and though only for a short arm centrifuge with fast spin rates, it is the first chance to validate some of our ideas about medical effects of artificial gravity- or disprove them. Does it counteract some of the zero gravity issues if you rest or sleep in full or partial gravity? Do short sessions each day have a spill over effect on your health throughout the day, and indeed your stay in space, and if so how much? Does it help with the issues of malnourishment and dehydration if you eat and drink in full gravity? Do you need to exercise in full gravity to prevent bone loss, or is there some benefit also just from sleeping in zero g? Is it easier for astronauts to adapt back to conditions on Earth at the end of a long mission, if they have been exposed to artificial gravity regularly in space. What are the effects of low gravity on the body? What are human tolerances for spin rates in true artificial gravity conditions, and how much does this vary between individuals? Do humans experience nausea as expected, in high spin rate centrifuges in space? Are astronauts able to adapt to longer periods of artificial gravity and higher spin rates with repeated exposure? Future spaceships might have separate areas for eating, sleeping, resting and indeed toilet facilities, all under artificial gravity. Astronauts might have individual hammocks which they can set to their own preferred spin rates for sleeping. Astronauts who are particularly tolerant of high spin rates - and who get most medical benefits from it - would be like the sailors of our seas in their small ships that rock in the huge waves you sometimes get at sea. They'd be the ones who could go on pioneering missions through the solar system, with tiny spaceships, with just enough room for a few centrifuge hammocks. If they can't tolerate spin rates quite so fast, or for astronauts who are more sensitive to the spinning motions in a tiny centrifuge, you could have integrated sleeping centrifuges like the Nautilus X (centrifuge diameter 9.1 or 12 meters). The data we get from this experiment would influence design of future spaceships like this. Larger research stations using the tether system could follow at a later date. If this works, it might give a way to keep humans healthy for long range human interplanetary flights, to Mars orbit and even beyond, to Jupiter as well perhaps. However, surely we'll want to do full scale tests closer to Earth first. There are many things we need to get right before an interplanetary flight. We need to sort out the technologies for closed system habitats - and find out which works best in space through experience - for instance using algae to generate oxygen, or growing all the food you need in the habitat. We also need to sort out radiation shielding. And we need to solve the issues of zero gravity. If we get promising results for short duration spaceflights, the next step would be to try long duration flights, but surely, closer to Earth. We want some way to return the astronauts to Earth quickly if they still get sick from zero g long term, or if anything else serious goes wrong with the simulated interplanetary mission (some kind of Apollo 13 type disaster). If so, one of the best targets might be the L2 position on the far side of the Moon. The L2 point is a point where the gravitational effects of Moon and Earth balance out, on the far side of the Moon. It's an unstable equilibrium, spacecraft go into "Lissajous orbits" around it and then will eventually escape, but it doesn't need that much fuel to stay in position. You can also move easily, with very little fuel, to the L1 point between Earth and Moon. It's an ideal place to do telepresence operation of robots on the far side of the Moon, and NASA have considered it as a place to send astronauts to, for their first deep space missions. Tsiolkovskiy (crater) - one of the features of the far side of the Moon, and the only large Maria on that side (lunar "sea"). Astronauts could hover above the far side at the L2 position, and would never see the Earth. They would be out of direct radio communication also, and would need to communicate via satellites or ground stations on the Moon. They would be as isolated from Earth as it's possible to be, short of a true interplanetary mission. Perhaps this might be a good precursor for true interplanetary flight. There, you'd experience the isolation of an interplanetary flight to some extent, with the Earth not even visible anywhere in the sky. You could simulate the varying light speed time delays as well if you wanted. Then, there is much we can do on the far side of the Moon. First, as for the near side, exploring the surface, we have very little by way of ground truth yet from the Moon, and the far side is surprisingly different from the near side (has hardly any of the lunar "seas"). Then especially on the far side, we could construct radio telescopes. Constructing a radio telescope on the far side of the Moon - for long wave radio reception so you don't need the smooth bowl shaped instruments of short wave radio astronomy. The great advantage of the far side of the Moon is that it's shielded from all the radio interference from signals on the Earth. Radio telescopes on Earth are blind in huge swathes of the radio spectrum. But the moon poses significant challenges, because of the extreme changes of temperature from day to night in the 28 Earth day "day". A mission to the far side of the Moon, explored by telepresence, might be excellent preparation for a telepresence mission to other places in the solar system such as Mars. You could send astronauts there for years at a time, with a closed system habitat, with no resupply from Earth - and see if they survive okay. If any major problems do occur, you can return astronauts to Earth, learn from them, and improve the design of your spacecraft. We could explore the craters of eternal night at the poles as well, with their layers of ice likely to preserve information about the early solar system. We might find meteorites from Earth on the Moon also, see Bits of Early Earth Hidden on the Moon There is a good chance that these might still have biomarkers and even intact microfossils from the first billion years or so of the Earth's history, which the researchers found would survive the entire process of ejection from the Earth and impact with the Moon. These meteorites would be found from orbit by searching for hydrated minerals, then rovers on the surface could look for smaller fragments. This could be a good precursor mission before the first telepresence exploration of Mars from orbit by humans. It would also be a most valuable mission in its own right. Here, I'm using Earth gravity 9.81 m/s2, Mars gravity 3.711 m/s2, Lunar gravity 1.622 m/s2. So lunar gravity is about 16.5% of g, and is almost exactly one sixth of full g.
To a good approximation (2 significant figures) π2 = g. So the 1 meter radius centrifuge with 30 rpm, so 1 rotation every 2 seconds has v2 of π2 m / sec2 so almost exactly 1 g.
You can work out many of the other values from that. First, length of tether varies as inverse square of spin rate. So, if for instance you halve the spin rate and you need four times the radius for the same amount of artificial g.
If you divide spin rate by 10 then tether length is multiplied by 100 (so 3 rpm needs 100 meters when 30 rpm needs 1 meter) - and so on. Then another neat thing. If you reduce the radius while keeping spin rate constant, gravity goes down linearly. So from full 6 at 1 rpm and 900 m, you get a sixth g, lunar gravity at 1 rpm and 150 meters. Then one other useful maths trick. If you multiply radius and divide spin rate by same amount, perimeter velocity is left unchanged, but radius changes. So this changes the amount of gravity by the given amount (because of increase in radius). So for instance from 30 rpm full g you can deduce, a rotation of 15 rpm at 2 meters and half of g (half of spin rate, double radius so velocity same, gravity halved). Similarly a rotation of 5 rpm at 6 meters (divide spin rate by 6, increase radius by 6) gives a sixth of g (lunar gravity). It's because of these relations, and the coincidence that π2 is almost the same as g, that you get so many whole numbers in the table. Can Spinning Habitats Solve Zero g Problem? And Answer Low g Questions? I'll be a guest on Dr Livingston's spaceshow (podcast and radio broadcast) on 14th March to discuss these and other topics.